French President Emmanuel Macron met Pope Francis for the first time on Tuesday. The issue of migrants, should be discussed at the meeting Tuesday morning. Emmanuel Macron had breakfast with the community of lay Catholics Sant'Egidio, who are closely involved in the reception of migrants and one of the organizers of some of the "humanitarian corridors" bringing Syrian refugees into Europe. Macron has called for stronger ties between the state and the Catholic Church. As a schoolboy, Emmanuel Macron decided he wanted to be baptised as a Catholic, despite his parents' displeasure. It was "the start of a mystical period that lasted for a few years," the French president said in 2017. In his mid-teens, he had distanced himself from the church, and he now considers himself to be agnostic. He once explained, "I believe in a form of transcendence, that's why I thoroughly respect the role of religions in society." The 40-year-old has also decided to accept being made an honorary canon of St John Lateran, the cathedral of Rome, a tradition dating back to the 15th century when the French state and church were indistinguishable. France is strictly secular under a landmark 1905 law that separated the state from the church. . Macron's decided to accept the honorary canon title after comments in April in which he said he wanted to "repair" the "bond" between church and state. Macron believes that religious leaders have a role to play in helping French society. Catholicism is still France's biggest religion and many believers worry that France is moving too far from its traditional Christian roots. "At a time of great social fragility... I consider it my responsibility to stop the erosion of confidence among Catholics with regard to politics and politicians," Macron told church leaders in April. The place remains unchanged: Pope Francis received the French president in the library of the apostolic palace. What was more surprising was the very long duration of their interview: nearly an hour alone with an interpreter. The French president, accompanied by his wife Brigitte Macron and a small delegation, arrived shortly after 10:30 in the Vatican, under a resplendent sun. 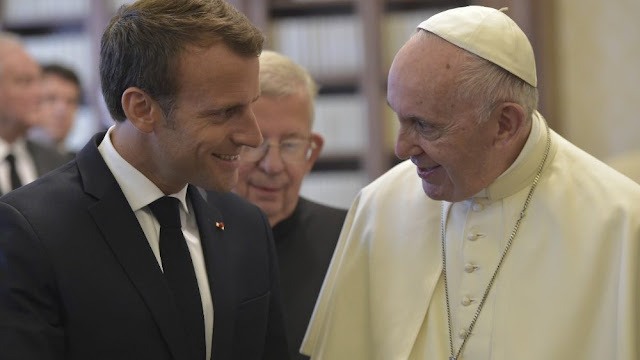 After crossing several salons, jewels of the pontifical palaces, Emmanuel Macron was welcomed by Pope Francis on the threshold of the Vatican library. "Hello, welcome": were the first words of the Holy Father, smiling before exchanging a handshake with his host. The French president and the Pope then discussed privately for 57 minutes. According to a statement from the Holy See Press Office, the two men spoke about environmental protection, migration, the issue of disarmament, conflict prevention and resolution, especially those currently under way. Middle East and Africa. The European project was also mentioned. At the end of this interview, Pope Francis and President Emmanuel Macron proceeded to the traditional exchange of gifts. The Holy Father offered a medal of Saint Martin, Bishop of Tours and Apostle of Gaul to Emmanuel Macron, as well as several of his texts, including the encyclical Laudato si ', but also the apostolic exhortation Gaudete and Exultate on call to holiness. "It's the middle class of Holiness," the Sovereign Pontiff whispered to the French president, handing him the document. Other present: the message for peace this year. Emmanuel Macron, accompanied by his wife Brigitte, for his part offered to Pope Francis a rare edition in Italian of the Diary of a country priest of Georges Bernanos, a very popular author of the Pope. A particularly warm moment, even affectionate, and it is very smiling that the Pope and the French president have left each other. Emmanuel Macron then met with Cardinal Pietro Parolin, Secretary of State of the Holy See and Msgr Paul Gallagher, Secretary for Relations with States, before joining the French Embassy near the Holy See, the Villa Bonaparte, for a lunch. The president is accompanied by his delegation, made up of 12 personalities, including the foreign affairs and interior ministers but also the president of Secours Catholique, the founder of Samu Social, as well as intellectuals Rémi Brague or Dominique Wolton and personalities. medias.